If I have some minor NewGRF projects that don't warrant getting their own post, they will get posted here. It can fit a whopping 8 people and go a massive 309kmh. Sprites for this used for the Vactrain Set. It's awesome. Check it out! A newGRF for the E001; JR-East's luxury train. Balanced for use with the Japan Set. The train comes in one 5 tile piece. No wagons required. Capacity increased for playability. This trainset has all diesel railcars, steam locomotives and electric trams of Okinawa. On top of that this set includes the Yui Rail monorail and some carriages. Balanced for use with the Japan Set. Not much of a set but eh. 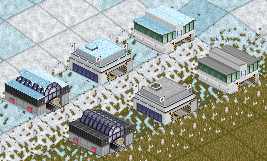 A newgrf with a futuristic train station. Developed for the November 2018 TT forums screenshot competition. RIMS - Real International Maglev Set | Adds real maglevs from all over the world. MTS v2 - Maglev Track Set v2 | Adds various railtypes for use with RIMS. NATS - Nagoya Area Train Set | Adds a large variety of trains from the Nagoya Metropolitan Area, the third largest of Japan. The various North Korean Sets | Adds everything you need to roleplay as everyone's favourite barnyard animal. Japanese Suspended Monorail Set | Adds all commercially used suspended monorails from Japan. 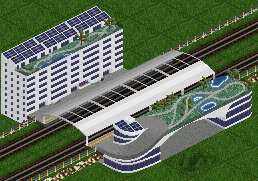 Monorail Track Replacement | Replaces monorail tracks with something more tolerable. Last edited by Erato on Mon Dec 03, 2018 6:51 pm, edited 14 times in total. Very nice! Very easy to saturate the network, though. The train comes in 1 5 tile piece. No wagons required. Capacity increased for playability. A trainset with 3 railcars of the Okinawa Prefectural Railway and the monorail train of Yui Rail. Balanced for use with the Japan Set. That Okinawa trainset is a great thing. As the Japanese set doesn't give any, i can only thank you. Last edited by Erato on Wed Jan 31, 2018 4:13 pm, edited 1 time in total. So I forgot to check the tram costs. They were waay too low. Why didn't anyone tell me? - Fixed alignment of the purchase window sprite. - Fixed alignment with the tracks. - Improved the way it looks in the depot. - Fixed the extremely low mass. Just an FYI - this still shows up as Okinawa Trainset 1.1 on the NewGRF selection menu. Ah I see. Thanks for reminding me. It's fixed now. Apparently the monorail didn't have the right length for like half a year. Because m4nfo is trash this set will not be expanded upon. Last edited by Erato on Tue Dec 04, 2018 6:01 pm, edited 2 times in total. Erato, as you did not specify a licence for your source code then do you consider that it belongs to the public domain from now on? While I really do not care, I did specify it in the OP of this thread as being CC BY-NC. For the purposes of this community that means do whatever just credit me. Anyone else also getting this error? Last edited by Erato on Tue Dec 04, 2018 6:01 pm, edited 1 time in total. Thnx, works now, interesting to see how you did all those curved lines, well done! One little tip though for the future, the watersequence is the wrong way around I think, the waves are moving inwards rather than outwards to the "beach". Doing the animated water color sequence the other way around would be better for future things if you are going to use them.